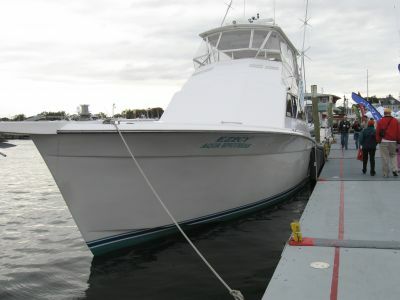 We will be headed back to Anchor Bay in the begining of May for the hard-top to be removed, extention installed, boat painted, etc. 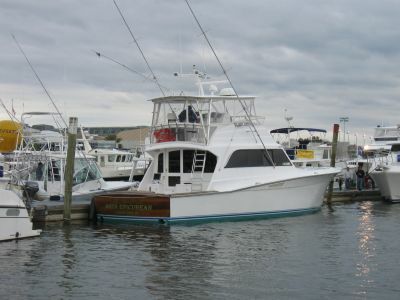 The boat will be at Sunset Marina in Ocean City, Maryland for the month of August. 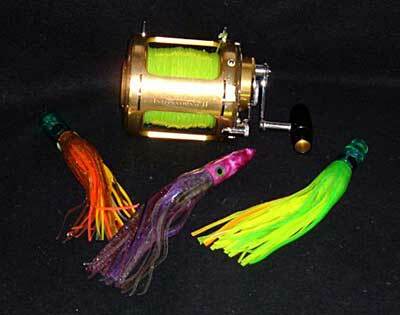 We plan to fish the "White Marlin Open" and the "Mid-Atlantic 500,000". 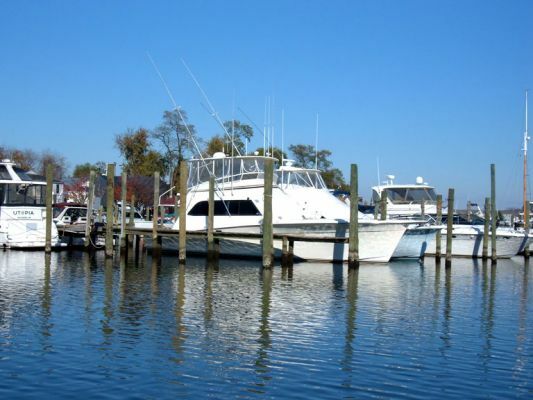 Here we are at the Annapolis Powerboat Show. It rained all four days of the show! We did stay warm and dry on the EZ2CY enclosed heated bridge. While attendance may have been low, those that did come were very positive. Note the size of the fenders that did a "BIG" job when the wind blew the night before yet deflate in seconds to be stowed in a "SMALL" compartment. 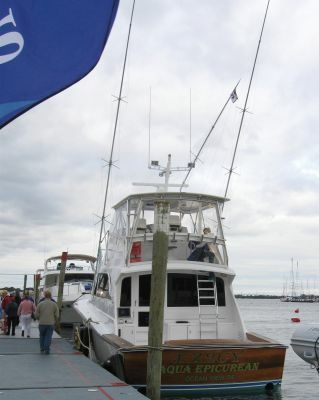 The custom bow chocks, cleat plates and hawse pipes made by Canvas Designers got special attention and many compliments because of the boat laying side to. 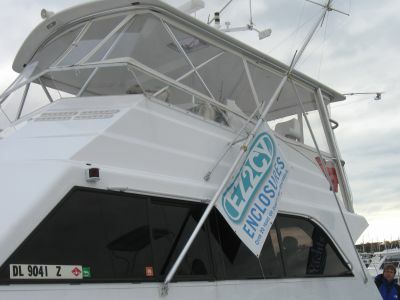 While showing the enclosure, people asked about many of the projects and products on the boat. The football game playing on the Argonout monitor caught their eyes as they walked toward the boat as did the Decadence carpet on the aft deck. Once on the bridge they noted the Garmin 4212 with the game playing on it and sat on the Sunbrella cushions. The E-Plex system had rave reviews for its ability to not only keep the Captain informed of everything on the boat, but the ability to do something about it from the bridge. Note Mike from Canvas Experts peeking out on the lower right. Other items that caught people's attention were the Imtra lighting, the mast from GulfStream with the Buell Air horns. One of the boats would occasionally blow its horn and we could not resist blowing the Buell triples to let them know what "real horns" should sound like. If they did venture inside they were impressed by the "First Mate" air door and loved the "Mark Ray" art on the floor. Considering the weather another favorite was the "Brew Express" coffemaker. Of course we were all comfortable with heat from Dometic. All in all, our boat in the show was received well.